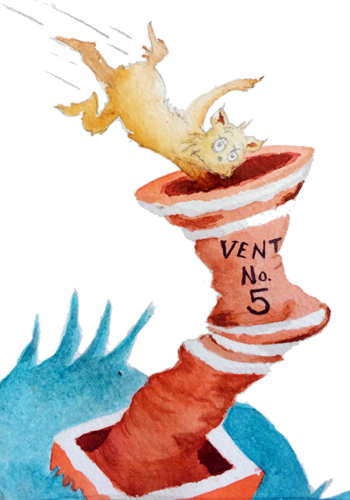 Vent Number Five is an illustrated blog by Benjamin Dorr. My goal: accompany each lengthy essay with a drawing/painting and vice versa. Sometimes I fall behind. Sometimes the relevance of the art to the post will just have to remain a mystery. Leaping into Vent Number Five has become a metaphor for a detour from my career path as well as this little creative enterprise. Because a bird-filled tunnel is still preferable to facing certain death by poozer, right? Whether Vent Number Five leads to something new or back home again is a part of the adventure. I write here on issues that matter to me such as media, technology, and their impact on society, as well as broader themes such as personal liberty and individualism. All opinions, unless otherwise cited, are my own and subject to change. Speaking of citations, I try to link all references, but if you believe I have erred, please reach out in the comments or by email: contact at ventnumberfive dot com. You can learn more about me and the work I stays doing (implying informally all formal conjugations of “I do”) at BenjaminDorr.com (coming soon). Until then, just go to LinkedIn. Also, my webcomic that I write and illustrate with Bryan Keefer can be found at FounderingComic.com.